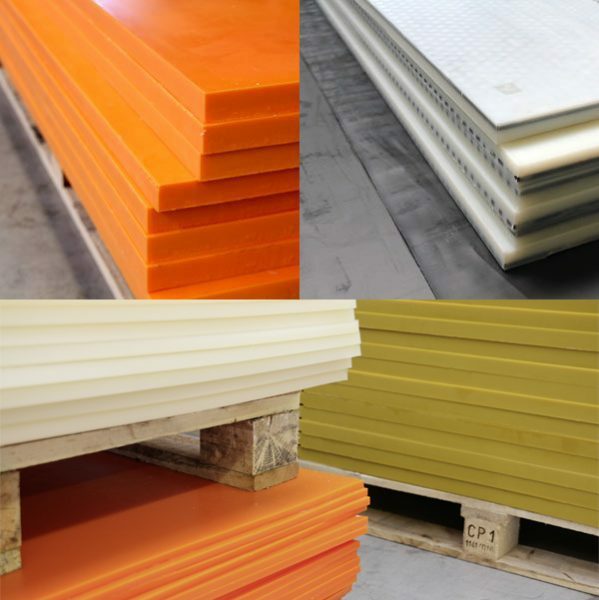 The standard dimensions of our polyurethane sheets are 2000 x 1000 mm as well as 3000 x 1000 mm at the height you require. We also produce special dimensions up to a length of 5500 mm in various formulations, colours and heights. We produce sheets from 55 Shore A up to 97 Shore A (also available in Shore D grades on request). In a special production line, we produce sheet dimensions of 5000 x 2500 mm from a single mould. This makes it possible to provide seamless surfaces in this format. We can produce popular centrifugal products by sheet centrifugation. These are marked by particularly good homogeneity. Standard dimensions are 2000 x 1000 mm and 3000 x 1000 mm in any colour. Perforated plates, meshes, expanded metal and steel plates can be coated in almost any hardness and compositions. All sizes and levels of quality can be split and cut with water-jets on our premises.